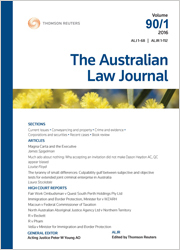 Thomson Reuters is pleased to announce the appointment of Associate Professor Colin Picker as the new Overseas Law Section Editor for The Australian Law Journal. Associate Professor Picker teaches at the University of New South Wales (UNSW). Prior to joining UNSW in 2010, Colin Picker was the Daniel L Brenner/UMKC Scholar & Professor of Law at the University of Missouri – Kansas City School of Law. He entered academia in 2000, after practicing in the Washington DC law firm Wilmer, Cutler & Pickering. His practice included transnational & trade litigation, international transactions and international congressional policy work. Picker publishes in the areas of international economic law, public international law and comparative law. He was one of the founders and is presently Executive Vice President of the Society of International Economic Law. He has also been active in the International Economic Law Group of the ASIL (Chair 2005-2007), and in the American Society of Comparative Law (former member of the Executive Council and former Chair of the Young Comparatists Committee). Colin is a JD graduate of the Yale Law School and Bowdoin College (Political Science & Russian). Associate Professor Picker’s international knowledge and experience will mean subscribers get the opportunity of reading his expert legal analysis of overseas law issues published in the Journal. We wish Colin all the best in his new role.